It’s so dry in chukarland that finding birds, easy on opening weekend, has become tougher than gristle on roadkill. In three days of hard hiking up, across, and down some very good looking habitat, we witnessed a total of five or six coveys, most of which busted wild. With temperatures in the mid-80s continuing through this week, and no precipitation forecast, it doesn’t look like next weekend will be any better. Still, getting out is better than staying home. 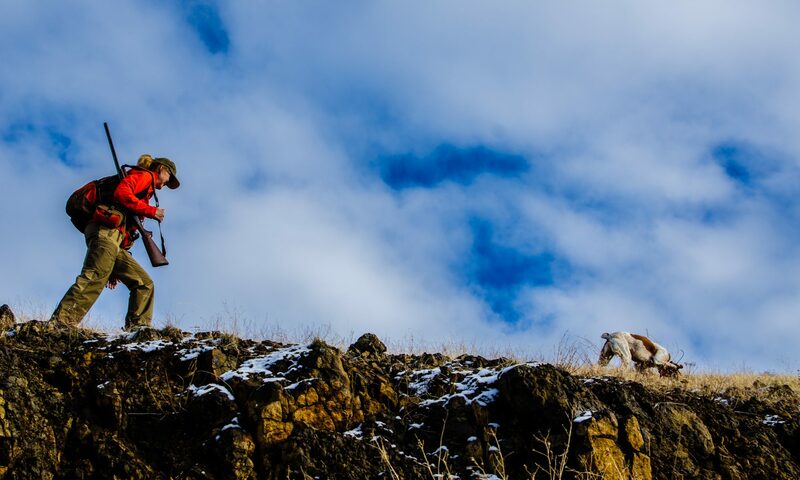 A friend with a year-old Pointing Griffon made the long drive to our area for his first taste of chukar hunting. He and his dog did fabulously, with Talisker making the only point on the first day. We saw a few more birds the second day, both high and low, but only managed one pointed covey and a couple birds. Rob and I will remember the rock-bound chukar laughing themselves silly at us while we stumbled down the talus slope in defeat. The next day, which was the first time I’ve hunted chukar for a third straight day, saw the return of The Kid. If you’ve followed this rag for a while, you’ll know I’m in danger of becoming the World’s Worst Chukar Guide when it comes to hunting with this intrepid youngster. I’ve dragged him up and down some horrendous stuff in search of his first chukar. He’s seen points, wild busts, false points, short, medium, and long creeps, gotten a few shots off, and watched me miss plenty of times. But he has still yet to bag a chukar. So I was determined to change that last Sunday. We hunted some new ground that looked promising. After hearing a group calling up high, we put the sneak on them, which turned out to be the most difficult single pitch climb I’ve ever done, more than 1,000 feet in an eighth of a mile. But we did it, and found some nice old sheds right at the peak, which prompted The Kid to deduce we were the first folks up there in at least a couple years. Despite being a bit beat up from a football game the previous day, The Kid matched me step for step. It won’t be long before I’m telling him to slow down and wait for me. We slowly worked down and across, following Angus and Peat (who managed this outing without any trouble). Soon Angus got birdy, and then locked up in some tall grass on a steep decline. The Kid and I both got in good position on either side of Angus. The chukar eruption that followed was sizable, but neither shooter could pick a single bird to shoot. All escaped. Out of water, we opted not to chase, and – aside from one long Angus creep on evaporated birds – that was that. There are lots of birds out there. We couldn’t find many in three days of hard work. We need rain. So do the birds. Pray for it. Great story with not so good ending. It started raining here in Gresham last night so hopefully some of this gets over there soon. Leaving here in another week, hopefully hunting/birds are better for my four month old GWP. Looking forward to stories with the kid. I remember when Conner shot his first chukar, you’d thought it was a six point bull elk he was so excited. Jake and I are having pretty much the same type season as you. Great start and than the dry conditions came. After two or three hours on the hill Jakes nose has a brownish green crust on it. Thanks, Larry. Glad it’s not just me. The Kid’s shopping for his own gun (been borrowing his brother’s, which is really heavy), and he’s a lefty. I’m recommending a Franchi Affinity Compact semi-auto, with the safety reversed. If you have any suggestions, I’d be interested to hear them. Great story! It is raining as we speak in Washington hope Idaho gets some of it. There are good numbers here in this part of the Northwest.Last weekend was the opener. Thanks, Scott. We got a wee bit of rain here last night. Good to hear you’ve got some birds over there. Where have you been hunting, up north on the Cecil D? I went out out today to a “secret spot” on the Rocking M and saw probably 8-9 covies of chukar and huns, and a few singles or pairs. Most of them were huns, and about half of those covies were wild flushes. It would have been one of the best days I have had hunting out there, if my gun had not decided to go “click” or “boom, click” every time I shot. The areas I have been finding birds have brittany-high grass, and are generally north facing, with seeps or springs nearby. They area also in the big fire scar from 2013, which I think is also the key. Great report, Chris. I haven’t done my homework on seeps and springs, so thanks for the reminder. Yes, we’ve mostly been hunting the northern part of the Andrus. I assume you’re driving in from Weiser; we’re boating in from Woodhead. Rain’s forecast for tomorrow and Sunday. Sorry to hear about your gun malfunction! Stay in touch.